My 2 most popular EK Model Kits, Dystopic and EK Cosmonaut 02 are in the process of restocking over at Industria Mechanika. They are available for preorder now and they should be shipping around late January 2017. Plus, Industria Mechanika is now selling copies of my book, Born In Concrete: The EK Series in their shop. They are currently offering it at a discounted price, so you can pick one up while ordering your model kit! Here's the link to the IMech Shop! A small batch (24 units) of 1/6th scale Dystopic Kits have been added to the Industria Mechanika Shop for pre-order. If you missed this kit before now is the time to pick one up. Head over to Industria Mechanika to order. The kits will be shipped in early February 2016. The 1/8 EK Cosmonaut kits are also in production. Figure #1 in the series should be available for pre-order soon. The 2nd and 3rd Figures in the series will also be restocked for a third run in the new year as well. 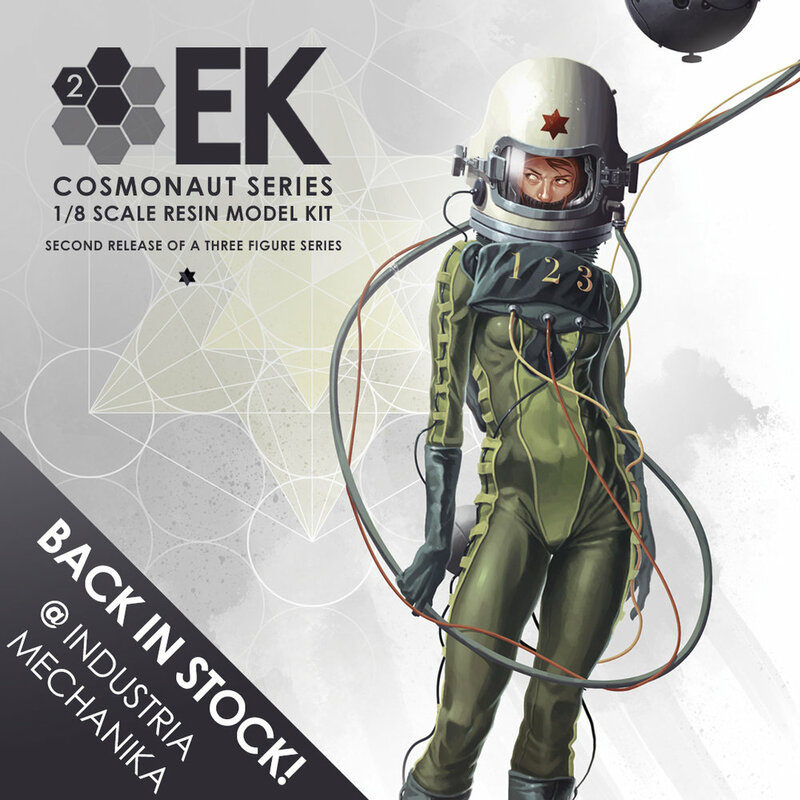 Industria Mechanika has restocked my 1/8th scale EK Cosmonaut 03 figure and is shipping orders immediately. If you missed out before you can get one here at the IMech shop. Plus, the stock of the female EK Cosmonaut 02 figure is down to a few remaining kits, so if you want one, now is the time to pick it up. Get it from the IMech shop here. The third kit in this series, EK Cosmonaut 01, is currently in the master print stage, and will then be broken up and cast for production. I will keep you posted on release dates! As I mentioned in a previous post, I am shutting down my webshop while I'm living and travelling over in Europe for the next year. Response to the shop was great and I spent sometime this weekend packing up the last orders that will be shipped out today. Thanks again to everyone that picked something up! My book is still available on Amazon and at other book retailers, and for those interested in the model kits based on my work, Industria Mechanika has the second figure in EK Cosmonaut Series available for pre-order now (shipping next month). Plus they will have the 2nd edition of the first figure back in stock next month, and the 1/6 scale Dystopic will be back in stock in the fall. Here is a sneak peak at the master sculpt/print for the next figure in the EK Cosmonaut Series. Expertly modelled by Gene Campbell and printed by Des at Ownage, this figure captures all the detail of the original painting. In the final kit the visor will be clear, so the interior head will be visible. These should be available from Industria Mechanika in late June/July, 2015. I will post again when they are in the IMech shop! 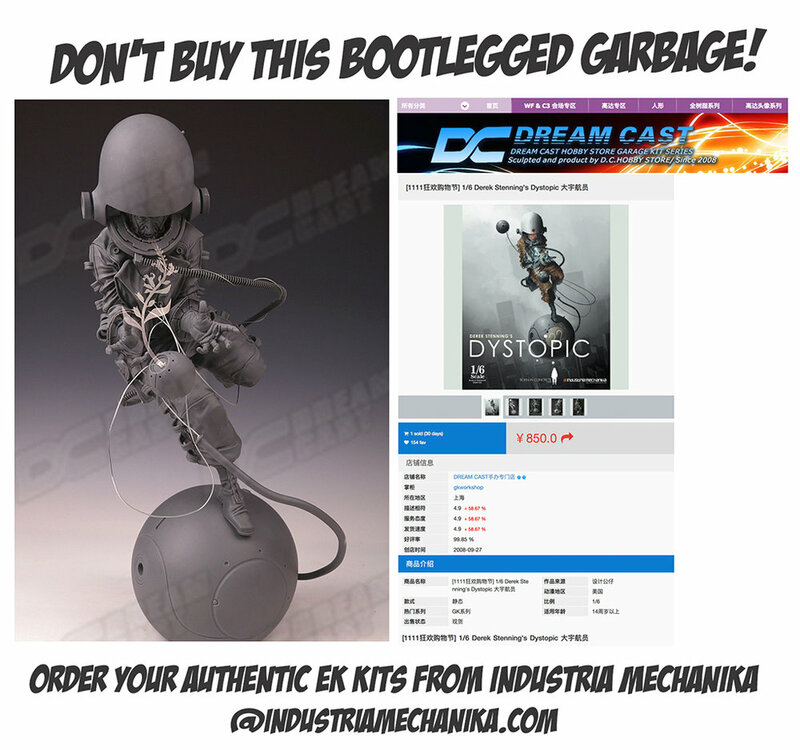 Industria Mechanika has added some Dystopic and EK Cosmonaut #3 kits up for restock preorders on their website. This run of these kits should be shipping in May 2015. If you missed them before now is your chance to pick one up! Check them out at the Industria Mechanika Shop here. The second figure in the 1/8th scale, three piece EK Cosmonaut Series is complete and off for printing, casting, etc. Masterfully modeled again by Gene Campbell, this kit will have the same level of detail and quality as the last two kits. The packaging artwork is also complete so hopefully it will be be ready for pre-order and release fairly soon. I'll post again once the dates have been firmed up by Industria Mechanika. Until then enjoy this sneak peek and go check out the other great kits at Industria Mechanika.